It appears that December got the best of me. Even though I hardly posted, I certainly did craft...but mostly Christmas presents, which of course I couldnt show! I'm still finishing a few up - thank goodness for an understanding sister-in-law! I'll hopefully show all that stuff later. 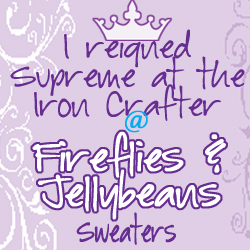 I do want to say THANK YOU to everyone that voted for me in the Fireflies & Jellybeans Iron Crafter: Clothespins contest. I won! Woo Hoo! Totally made my day week YEAR! So, maybe this looks like just an oversized bib to you. My mom made this for my dad years ago, from the fabric leftover from making him a dress shirt. But, according to my dad, REAL men dont wear bibs. My husband is in desperate need of a shirt protector. Despite his best efforts, he always manages to get food on his shirt. And I strongly dislike spending hours trying to get stains out. (this one saw me through 3 pregnancies, plus the 10 years that my husband wore it) and upcycled it! Cut off the collar by cutting horizontally right below the front of the collar. (See where the dotted line is?) You should be cutting both the front and the back of the shirt at the same time, so that they'll be the same shape. Cut off the bottom - with a rotary cutter if you have one. (You'll use this for the ties.) I would cut at least 2 inches off; for this one I cut 3 and it made pretty wide ties. Round the bottom corners. I used a bowl as a guide. With RIGHT SIDES together, you are going to stitch around the outside(the dotted black line below), leaving the straight top unstitched. Press (or be lazy like me and skip it, but get some funky wrinkles when you're done ;) ) and topstitch around the outside edge only. Now you're going to gather that straight top edge. Set your sewing machine to the longest stitch, and increase your tension (I took mine all the way up to 9, the highest it goes). Stitch across the top edge, making sure NOT to backstitch when you start or finish. Your machine should gather it as you sew. *note: this t-shirt was pretty thread-bare from lots of use. When I made one with a newer, and slightly thicker, t-shirt it didnt really gather. I just grabbed a thread from one end and manually gathered it, although I think if I had tried to gather the two layers seperately they probably would have been okay. Take the piece you cut off the bottom (it should be kind of a loop), and cut it so its one long strip. If your shirt had side seams, just cut along one of the seams. 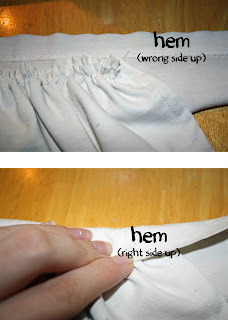 Lay the strip with the WRONG SIDE up and the hem of the t-shirt at the top. Place the shirt protector on the strip, centered, so that the straight gathered top hits right below the hem (top picture below). 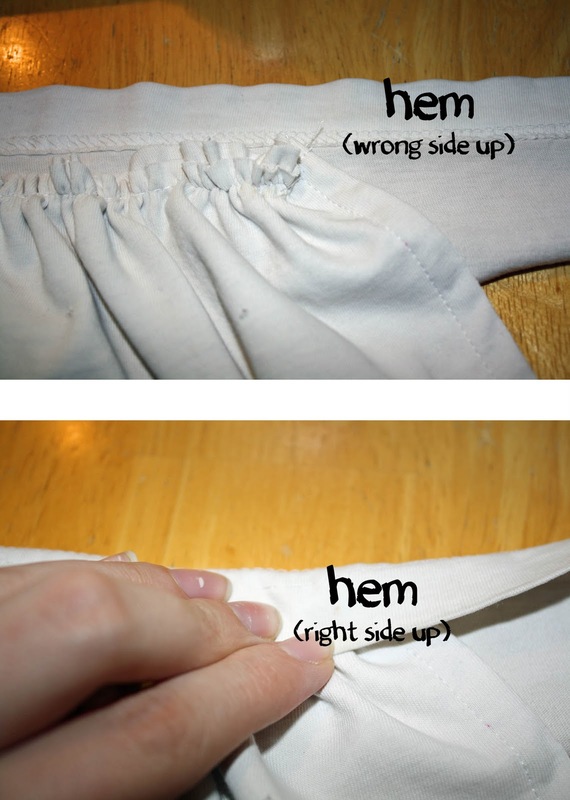 Fold the strip over, so the hem is now on top of the gathering, with the right side facing you (bottom picture below). Pin the strip in place, along the entire strip as well as the gathering of the shirt protector. Starting at one end of the tie, stitch along the lower edge. Go slow over the gathering, and make sure that you are catching the back of the strip/tie too. (Thats why I suggested cutting at least 2 inches off the bottom, so you have plenty of fabric to sew on. And if you used a rotary cutter you will have a nice clean edge on the back.) You will have a raw edge on the back of the tie, and on the ends (unless you think to tuck them in before you sew, which I didnt) but with a T Shirt thats okay because it wont unravel. It might curl a little with washing, but I think it'll look just fine. It was kind of hard to get a decent pic of the shirt protector, because the gathering makes it look funny when its laying flat. But it does a great job of keep food off my husband's shirt, so thats all that matters, right? !